Jerry Miller (born July 10, 1943 in Tacoma, Washington) is an American songwriter, guitarist and vocalist. 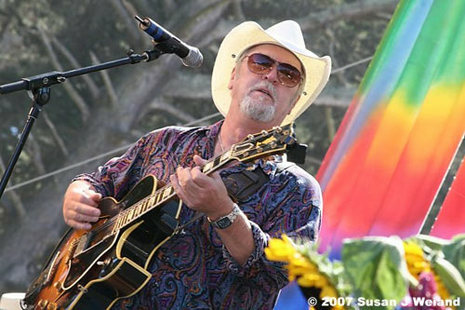 He performs as a solo artist and as a member of the Jerry Miller Band. He is also a founding member of the 1960s San Francisco band Moby Grape, which continues to perform occasionally. Jerry Miller's professional career began in the late 1950s, playing and recording with popular Northwest dance-rock bands including The Elegants. He contributed guitar work to the an early version of the hit record I Fought the Law by The Bobby Fuller Four, and toured with Bobby Fuller in his predecessor group to The Bobby Fuller Four. While both were playing locally in Seattle, prior to becoming internationally famous, Jerry Miller befriended Jimi Hendrix. Along with Larry Coryell, who was developing his reputation as a guitarist while attending the University of Washington in Seattle, they would regularly get together to watch touring bands visiting the Seattle area. One particular club was the Spanish Castle, in Des Moines, Washington, between Seattle and Tacoma. The later Hendrix song, Spanish Castle Magic, was based on his experiences with fellow guitarists at the Spanish Castle in Des Moines.